Aaaaaah basketball… (in my Homer Simpson voice). Even with a short season, I’m glad NBA basketball is back- not a football fan. What’s being done stateside to combat and prevent AIDS, including activities for World AIDS Day. 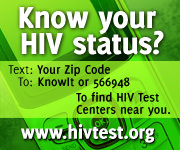 If you do nothing else today, get tested to know your status.